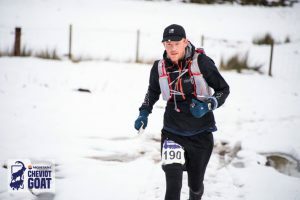 I’ve never written a race report before, however, due to the massive amount of support and well wishes over the last few days I thought that needed to change, so here is my report on The Montane Cheviot Goat. As soon as I heard about this race I was intrigued, I logged straight onto the website, read all the information and instantly thought, there is no chance I’m not doing that especially in December and that was the end of it. Fortunately, the organisers kept putting out info on it and then I heard my mate Andy Berry had signed up. He’s the guy who first got me into ultra running. 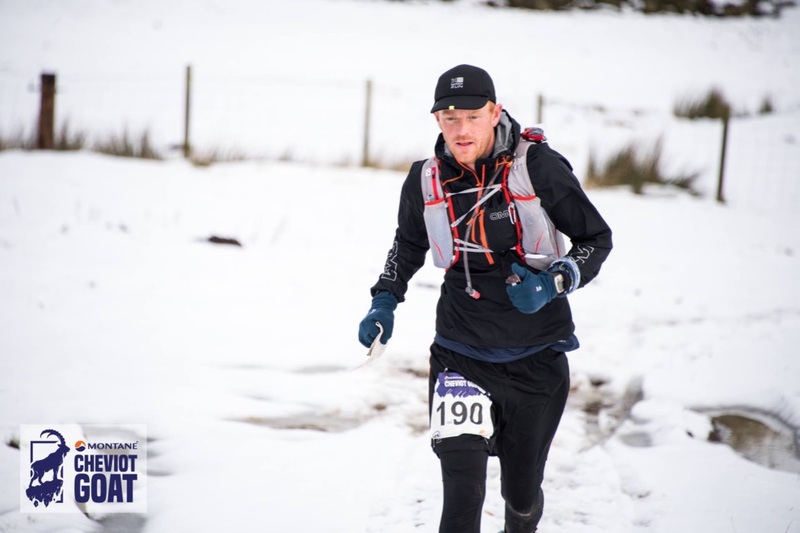 He’s an absolute machine, but every time he’s completed a race, I’ve wanted to do it, convincing myself if he can do it so can I. Andy Berry is also the reason I’m attempting the Bob Graham Round on May 5th. Andy won the Cheviot Goat so I really should have found someone a little easier to compete with! 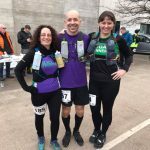 As I have been building up my fitness for the BGR, I’ve been putting in a lot of training, including heading down in the middle of the night, on a few occasions, to meet random fell runners and BGR enthusiasts I’ve met through online forums etc. 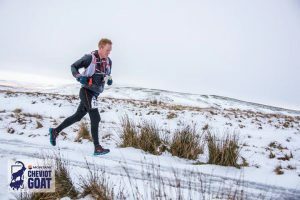 I’ve also trained quite a bit with Scott Watson after being massively inspired by his successful BGR attempt earlier in the year. It’s just as well I have been training so hard as I would never have completed that course without it. I’ve completed a 50km ultra and two 69 mile runs previously but they were nothing compared to the mental and physical challenge of the Cheviot Goat. Anyone thinking about it for the future really needs to appreciate this and read other people’s reviews of the course that can be found on The Cheviot Goat Facebook page. As the event was approaching, the weather forecast just seemed to be getting worse and worse with fog, gale-force winds and temperatures of -5°c with a wind chill of -20°c being reported. To add to my concerns, I’d read on a couple of Internet forums that many thought the event was way harder than people were expecting and a lot of people were going to feel way out of their depth and really struggle. This was not what I needed to hear before my first winter ultra! The day before the event I was trying to eat as much as possible with plenty of porridge, brown rice, chicken, pasta and sweet potato with a load of water to wash it down. My plan was to head up to a hotel just near the start at about 6 pm to ensure a good nights sleep but I didn’t end up setting off till after 8 pm and then had to go and register and collect my race number. It wasn’t as busy as I had expected, as many failed to register due to the weather! I ended up getting to the hotel at about 11 pm but the mattress was far too soft and the heating was far too hot, so I only ended up with about 4 hours sleep, again not ideal. I had to be at the start for 4.30am for kit check and safety brief with the race starting at 5.30am. I felt really fit and strong until I saw the others lined up who made me feel out of shape. We set off bang on time with everyone wrapped up tight with head torches blazing. I felt great at the start but my confidence ebbed a little at the first water station when I didn’t stop and found myself not knowing where to go. The course is totally unmarked and I took the lazy mans option of just following those in front, this strategy worked fine when there were people I could see in front! After rummaging through my various pockets for a minute, I dug out my map and compass and from this point on my map stayed firmly in my hand. The first few miles were on low lying ground with very little snow, but as soon as we started to climb this changed. Before long we had a good foot of snow to deal with. I was feeling great at this point and knew I was quite near the front of the field, as I could only count about 8-9 sets of footprints in the snow. Brilliant for my navigation, as my new technique was just to follow the footprints. The other benefit of being in the position I was, was the fact the front runners were acting as a snow plough. If I managed to position myself exactly in their footsteps, the going was nowhere near as hard. The snow had drifted quite a bit in places but I was still able to get a bit of speed up on the downhill sections. Quite often you didn’t know what you were stepping onto but at least when you did fall it was just into soft snow. My waterproof socks were a godsend at this point, as they have a wetsuit type effect. When the water gets in your feet heat up the water so they never really get too cold. I never noticed my feet being cold all day despite the conditions. After the first section of deep snow it thinned out and the sunrise was absolutely amazing. Myself and the woman I was running with, at this point, talked about how stunningly beautiful it was and what a fantastic feeling it was to be running there. I ended up leaving my running buddy not long after this conversation and shot off down the mountain feeling absolutely king of the world. 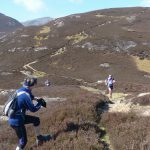 The feeling I had at this point has only ever been achieved, for me, whilst running in the fells. A little further along the route, I could see two guys operating a drone on top of the hill I was heading to. I never know what to do when I’m being filmed, so couldn’t decide to look serious, cool and focused or just shout woo-hoo and put my arms out as it hovered above. I think I went for an option somewhere in the middle and am really looking to see that bit of footage when I was on such a natural high. The next bit was a bit of a blur until we were nearing the halfway point and all I could think about was the rice pudding and can of coke I had in my drop bag. There was quite a climb just before the food station and one guy caught me up and then shot straight off up the hill leaving me standing. Soon after the guy passed me, I turned to see the woman I had been running with at sunrise also catching me up and it’s lucky she did, as I’d dropped my buff while searching for Haribos in my bag and she kindly retrieved it for me. We got talking again. She asked my name then introduced herself as Carol before we started talking about how well our mutual friend Andy Berry was running at the min. 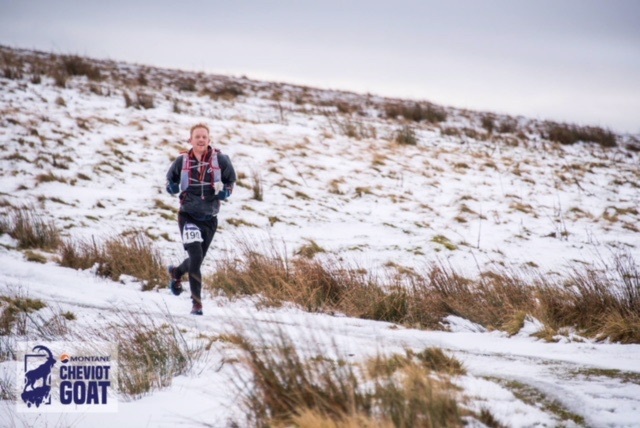 We talked about some other races and she mentioned ‘The Spine Challenger’, a 108-mile winter ultra, to which I said there was no chance I would ever enter. I asked her about it and she said she was running ‘The Spine’ race after doing it last year. That thing is 268 miles! I asked if she did well in it, to which she replied she got a good time. 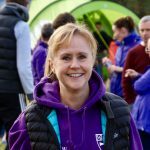 I later Googled the race and found out my running buddy was Carol Morgan who smashed the woman’s record in The Spine race last year by 43 hours!!!! When I got to the halfway point I was greeted with a hot cup of chunky vegetable soup and a bread bun, but all I could think of was my Coke and rice pudding. I ripped open my drop bag and nightmare the coke and rice pudding were missing. I must have put it in the wrong bag! After the soup and a nice bit of cake, I headed out with a Snickers in my hand determined to eat it, as I knew I needed it, especially after having missed out on the rice pudding. I think I carried the Snickers for about 3 miles before I finally got ¾ of it down but it was hard work and I just couldn’t finish it. The next section was starting to get tough, as tiredness started to kick in and I never saw a single person for miles. At this point, I was so focused on moving forward and watching the ground I got a big surprise when I looked up and saw the most amazing view of the sun setting behind it. The happiness of seeing the beautiful sunset was short lived as I suddenly started to worry about running in the dark once more. I can remember thinking at this point I have about 22 miles left, so that’s only two ten milers and a bit of a parkrun or a great north run and 3 park runs and that’s not too bad. There was a water station at about 40 miles and it was great to see. Whenever you reached a station or a marshal, they came to great you and gave you a round of applause. It was great seeing them after such a long section without seeing another soul. I can remember joking with them about the takeaway and beer I would be enjoying in a few hours whilst they were still out there. I really started to slow down after the 40-mile station and the great north run plus one parkrun I had left started to seem like a lot greater a challenge than I had initially hoped. I soon started the climb up to Cheviot and it seemed to go on forever. I think one mile took about 33 min’s and yet again I found myself in deep snow. This was probably my lowest point of the race mentally and physically, as I was just so tired and making very slow progress as darkness fell. I can remember thinking, if it starts snowing or raining heavy, am I even going take make it. It was at this point I considered ringing my wife, but I knew how worried she would get, so I didn’t. If I didn’t have a tracker with an emergency button on it I would have been extremely worried at this point, as I hadn’t seen another runner in hours. They don’t call this race the most lonely for nothing! I really wouldn’t recommend ever being in that sort of situation without a GPS tracker, a phone and all the proper kit, If a storm had come in at that point and I’d lost my bearings I don’t know if I would have even made it back! The snow made the very last of the light last longer and I waited until I couldn’t see more than about a meter before digging out my head torch, buff, thicker hat and waterproof trousers. The wind was also getting up at this point but I instantly felt better as I warmed up in my full kit. As I plodded on up The Cheviot I started to contemplate missing out a section of the course, just to give me that extra chance of making it to the finish. There was a checkpoint about 1km from the summit and the course brought us up around the trig point then down the same route. It just seemed so harsh making us go that bit further to come down the same path. I remember asking the marshal exactly how far it was to the summit, even though I had a map in my hand. I honestly think if he’d said two miles I would have just missed it out. He reassured me it was definitely only about 1km so I continued on. I can remember thinking at this point I wasn’t even bothered if I missed out part of the course, as all I could hear was the organisers saying you all know your limits so don’t exceed them and I felt right out of my depth at this point. I think the only thing that kept me going was the fact that I didn’t want to hand my race t-shirt back. We had been given them at registration but I’d already decided I’d hand it back if I didn’t complete and I really didn’t want to do that after everything I’d been through. Never before have I been bothered about a race t-shirt but this was no ordinary race. After reaching the trig point I got a massive boost from somewhere and felt great again. On my way back down to the marshal I passed 4 or 5 runners (the first I’d seen in hours) and made a real point of assuring them how great they were doing and it wasn’t much further to the top. Suddenly the possibility of finishing was back on! 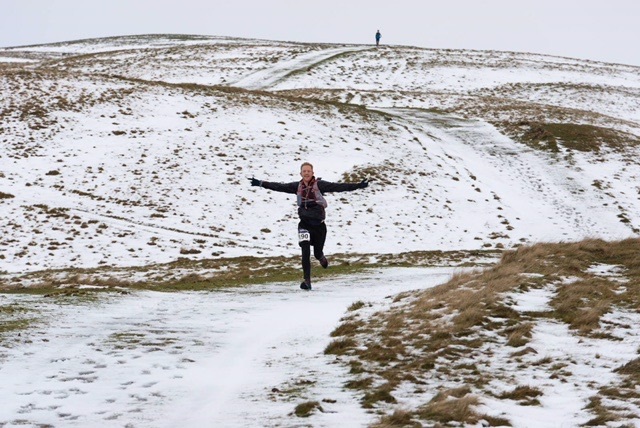 As I passed the 45-mile mark, the thought of another 10 in these conditions was an absolute nightmare; three park runs all of a sudden seemed almost impossible! I knew I needed more energy but just couldn’t bring myself to eat any more sweet stuff and the thought of a gel made me feel sick. I will definitely be packing a lot of savoury snacks on my BG attempt. Luckily I still had a load of high-energy mountain fuel in my water bladder so I just drank as much as I could and powered on. As I neared the bottom of the downhill from Cheviot, I could do nothing but walk and it’s not a good feeling knowing you really should be taking full advantage of the downhill but just couldn’t. I can remember looking back at this point and seeing two head torches slowly catching-up on me. I was so jealous I couldn’t make the most of the downhill like they were. 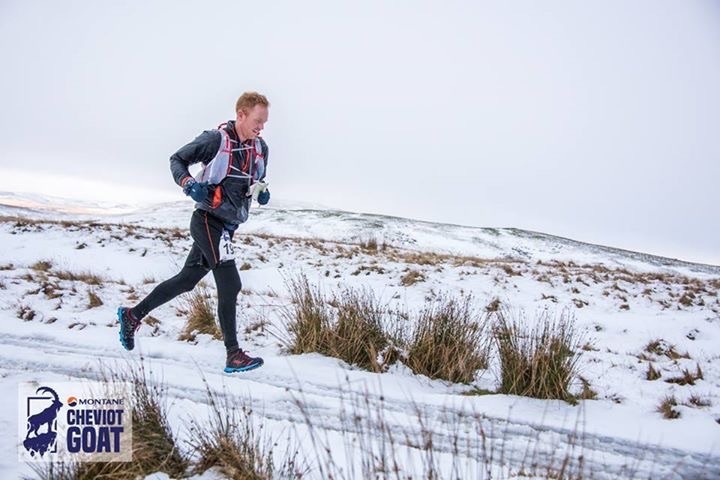 When that first runner passed me, he was the only one to have overtaken me in twenty miles, but it’s a good job he passed me when he did, as not long after he passed, his foot shot down through the snow and became completely stuck under a rock. Luckily for him, I was right behind him and was able to give instant assistance digging him out. We quickly dug away at the snow and he started to shout. His leg was going into cramp. Once all the snow was removed, we started digging out the soil and found that his foot was wedged between two rocks, thankfully one wasn’t too big and we were able to dig it out and free his foot. The above incident really brought home the extremities of the conditions we were running in. What if the other runner gaining on us had already passed me and my foot had got stuck and nobody was there to help me? I could easily have been stuck there freezing for 30 min’s plus before another runner caught up. If I’d been unable to move, I would have got very cold, very quickly. I did have the GPS tracker with an emergency button, however, due to the remoteness of the location, I couldn’t see the Mountain Rescue being able to get there anytime soon and that is a frightening thought! After many thanks from the freed runner, it was time to start the next climb, get these final few miles out the way and get the hell out of there. I could see a tread cut out of the snow on the line the runners before me had used, however, I just didn’t have the energy to use it. There was a fence running right the way up to the summit on my right, so I just chose to cling onto that to use it as a handrail most of the way up. The problem with using the fence to pull myself up was nobody else had used that line, so I was cutting through deep snow most of the way up, but I felt it was worth it. Reaching the top of Hedgehope was an amazing feeling as I was now in the final section of the map. I now knew I would make it and I could keep my t-shirt. I had pretty much given up all hope of running any of the course from here but amazingly my body kept finding that little bit extra and little runs broke out here and there. With about 3 miles or, as I was thinking, only one park run left, I was walking very slowly and bumped into two guys who worked for an adventure film company. They were making a film about one runner’s story and build up to this race and they offered to walk with me. This was fantastic and I will always be grateful to them. These guys were the first people I had really got to talk in hours. I have no idea what I was babbling on about to them but just having others with me at this point was a massive help. By this point, a few runners were catching and passing me so I just followed any lights I could see. The downfall of this lazy man’s option became apparent, once again, when it transpired a couple of guys in front had gone the wrong way and I had just blindly followed them. Luckily we didn’t go too far off track and again I was reminded of the importance of good navigation. With about one and a half miles to go, I started getting excited that the challenge was nearly over. The film guys took a call and I couldn’t be bothered to wait as they stopped to talk, so I just left them, without so much as thanks or goodbye. I feel really bad about this now but was just so focused on finishing at the time. With about one and a half miles to go my recently changed spare head torch battery died and I was left trying to run in the dark. There were a few runners a little way in front but I soon lost them as I just couldn’t keep-up trying to run without a light but I knew I was on the home straight now. I came off the fells and onto a road within striking distance of the finish but had no idea of my bearings and couldn’t see my map as it was too dark. My phone was in the bottom of my bag but I couldn’t be bothered to dig it out to get to the light, so I just started running on the road with no idea as to the direction I should be travelling. On reaching a junction I didn’t know where to go. A car passed which I tried to flag down but they mustn’t have had anything to do with the race and drove around me and left me standing waving like crazy. I was in a massive dilemma now. Do I just continue on in a random direction, as I know the end is a few hundred meters away, or go back to try and find another runner. I wasn’t thinking straight and just wanted to run in any random direction but then started thinking, what if I accidentally take a shortcut and get disqualified. I couldn’t risk having to give my t-shirt back now! Of course, the sensible option was just to stop and get my phone with a built-in torch out, but my brain just wasn’t working properly, so I went for the option of shouting a long list of swear words as I ran back up the road to where I had left the fells. Thank god two runners were just coming onto the road as I got back. I ranted at them for a minute about what had happened to me whilst following them back up the road I now knew well and over the finish line! A small group came out to applaud us as we finished and there were many congratulations from fellow runners and race organisers. I collapsed into a chair and swore blind to buy a drink for any person I ever see in any bar wearing a Montane Cheviot Goat T-Shirt! The pain in my feet was unreal as I pulled my trainers off and I could hardly walk over to my bags to retrieve my clean warm dry clothes. I pulled my fresh clothes on and called my wife, so happy to proclaim, I had finished and was still in one piece. As I sat there waiting for some feeling to return to my feet, I started sorting through my bags and instantly found my rice pudding and Coke in the top compartment of my drop-bag. It had been there all along…..gutted! This race is by far the hardest ultra I have ever run, it pushed me to the max both physically and mentally and although I swore never again at the end, I cannot wait to beat my time next year! 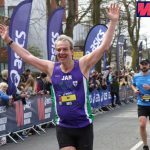 Thank you to everyone in the Striders who has helped me improve my running, as I would never have completed this run without your help!